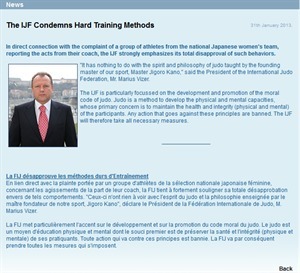 In direct connection with the complaint of a group of athletes from the national Japanese women's team, reporting the acts from their coach, the IJF strongly emphasizes its total disapproval of such behaviors. "It has nothing to do with the spirit and philosophy of judo taught by the founding master of our sport, Master Jigoro Kano," said the President of the International Judo Federation, Mr. Marius Vizer. The IJF is particularly focussed on the development and promotion of the moral code of judo. Judo is a method to develop the physical and mental capacities, whose primary concern is to maintain the health and integrity (physical and mental) of the participants. Any action that goes against these principles are banned. The IJF will therefore take all necessary measures.